The French government on Wednesday urged parties across the political divide to calm protests that have raged nationwide for more than two weeks, and signalled it was ready to make further concessions to avoid more violence. 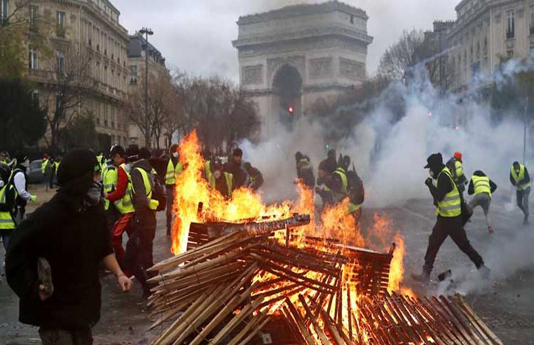 French President Emmanuel Macron appealed to rival political leaders as well as trade unions to help tamp down the anti-government anger that on Saturday led to some of the worst rioting in central Paris in decades, according to government spokesman Benjamin Griveaux. The protests began on November 17 in opposition to rising fuel taxes, but they have ballooned into a broad challenge to Macron’s pro-business agenda and complaints that he is out of touch with the struggles of ordinary people. Macron, whose approval ratings have plummeted to just 23 percent, is yet to comment publicly since returning to France from a G20 summit in Argentina on Sunday morning. Philippe on Wednesday called for a debate on the controversial tax cut, signalling it could ultimately be repealed. drove entrepreneurs to leave France. On Tuesday, Philippe had announced the first major retreat of Macron’s presidency when he suspended for six months a rise in fuel taxes scheduled for January 1.
battery of announcements targeted at low-income families. forced Macron’s predecessors into U-turns. fail to boost purchasing power. to deploy army units to back up the police. Adding to the image of a country in revolt, the main French farmers’ union said Wednesday that its members would hold demonstrations every day next week. Two truck driver unions have also called an indefinite sympathy strike from Sunday night, and students are blocking dozens of schools nationwide to denounce tougher university entrance requirements.